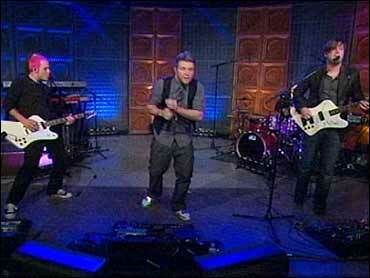 Blake Lewis used his beat-boxing skills to propel himself all the way to the final two in last year's "American Idol." Now he's a household name. Lewis just released his debut album entitled "Audio Daydream," which has been receiving critical raves for its creativity and artistry. It's no surprise, considering the way Lewis took a Bon Jovi classic "You Give Love a Bad Name," that Bon Jovi himself warned Lewis not to alter, and made it completely his own through a unique arrangement and his trademark beat-boxing. It was that performance on "American Idol" that helped make him a force to be reckoned with. Lewis says you can thank his band, A.D.D., for that. The group is comprised of his good friends from his hometown, Seattle. KJ Sawka is on the drums, Kent Halvorsen plays the keyboard, Johnny Nails is on guitar and Jeremy Lightfoot plays bass. On his MySpace page, Lewis describes the band as "A band of merry men of which the likes you shall never forget." "We're all a bunch of hyper and energetic people," Lewis told Early Show co-anchor Hannah Storm. "Audio Daydream," said Lewis, was mixed to sound like a mixed tape from the '80s or an electronic CD. He throws some beat-boxing over it and creates a sound that's different from anything else out there. But the idea for "Audio Daydream" isn't new. It started long before "Idol." Lewis says he began writing the album about three or four years ago. Writing was a process, he said, and his ideas didn't come to him all at once. "You're inspired differently on each day," Lewis said. "Getting in the studio with different creative people and just different melodies come out and different emotions."